NEW! 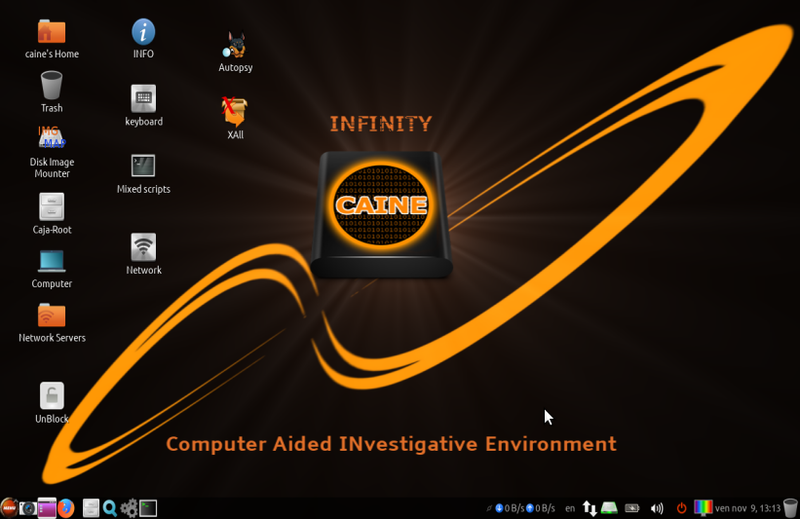 CAINE 10.0 "Infinity" is out! 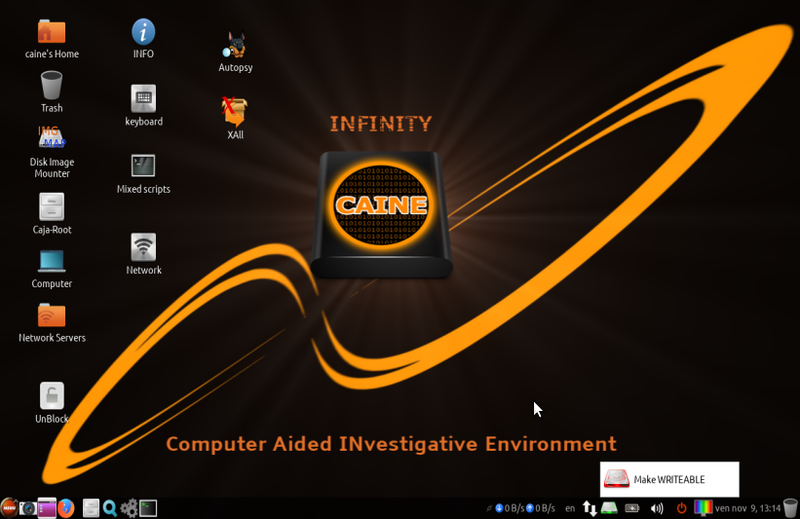 CAINE 10.0 "Infinity" 64bit - Official CAINE GNU/Linux distro latest release. Currently the project manager is Nanni Bassetti (Bari - Italy). We recommend you to read the page on the CAINE policies carefully. Based on Ubuntu 18.04 64BIT - UEFI/SECURE BOOT Ready! CAINE 10.0 can boot on Uefi/Uefi+secure boot/Legacy Bios/Bios. The important news is CAINE 10.0 blocks all the block devices (e.g. /dev/sda), in Read-Only mode. You can use a tool with a GUI named BlockON/OFF present on CAINE's Desktop. This new write-blocking method assures all disks are really preserved from accidentally writing operations, because they are locked in Read-Only mode. If you need to write a disk, you can unlock it with BlockOn/Off or using "Mounter" changing the policy in writable mode. CAINE is always more fast during the boot. CAINE 10.0 can boot to RAM (toram). INSTALLING CAINE: BlockON/OFF (blockdev) put the device in WRITABLE mode -> use Ubiquity or SYSTEMBACK -> Choose System Install -> Choose user: CAINE password: CAINE host: CAINE -> check "transfer user configuration files" -> Go! Ubiquity is the installer, even if for old BIOS based computers, you need to run BootRepair after the end of Ubiquity!. New tools, new OSINT, Autopsy 4.9.1 onboard, APFS ready,BTRFS foresic tool, NVME SSD drivers ready! SSH server disabled by default (see Manual page for enabling it). Mobile: gMTP and ADB added. Added: Recoll, Afro, Stegosuite,etc. etc. many others fixing and software updating. 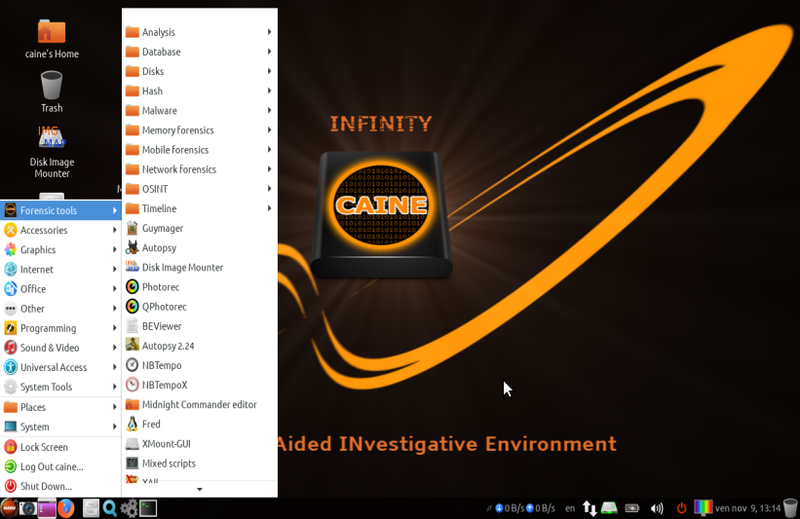 CAINE has got a Windows IR/Live forensics tools. 1) "rbfstab" is a utility that is activated during boot or when a device is plugged in. It writes read-only entries to /etc/fstab so devices are safely mounted for forensic imaging/examination. It is self installing with 'rbfstab -i' and can be disabled with 'rbfstab -r'. It contains many improvements over past rebuildfstab incarnations. Rebuildfstab is a traditional mean for read-only mounting in forensics-orient distributions. 2) "mounter" is a GUI mounting tool that sits in the system tray. 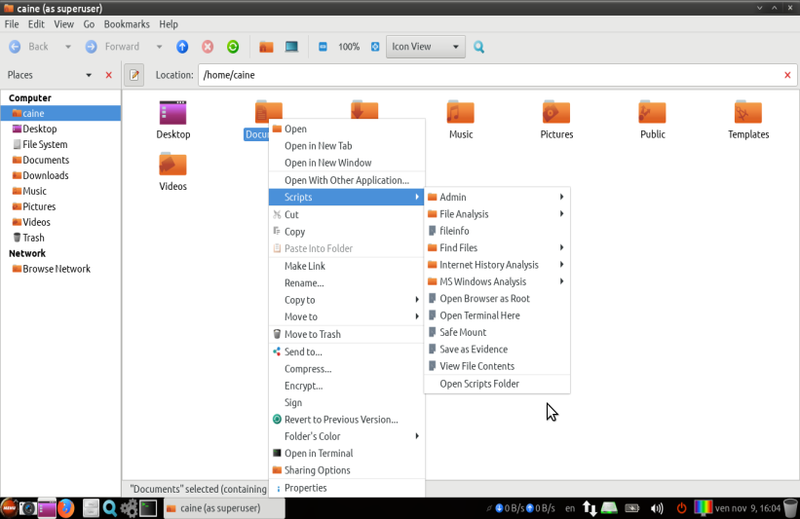 Left-clicking the system tray drive icon activates a window where the user can select devices to mount or un-mount. With rbfstab activated, all devices, except those with volume label "RBFSTAB", are mounted read-only on loop device. 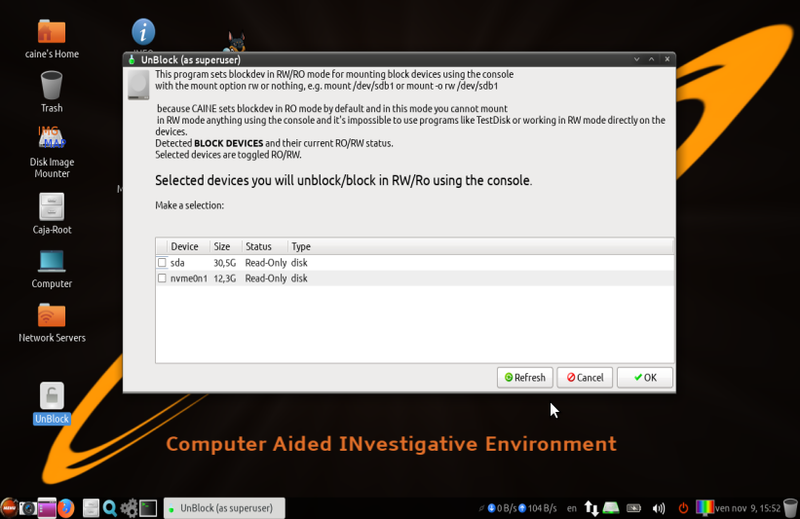 Mounting block devices in Caja (file browser) is not possible for a normal user with rbfstab activated making mounter a consistent interface for users. A green disk icon means the system is SAFE and will mount devices READ-ONLY on loop device. A red disk icon means WARNING, mounted devices will be WRITEABLE. 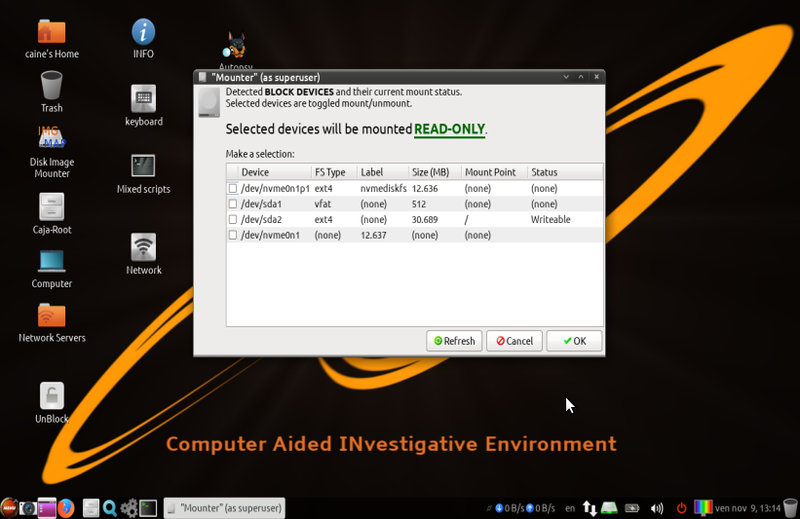 In CAINE 8.0 mounter can unlock and lock block devices in Read-Only mode. Left-click the disk icon to mount a device. Right-click the disk icon to change the system mount policy. Middle-click will close the mounter application. Relaunch from the menu. The mounted devices will not be affected by mount policy changes. Only subsequent mounting operations will be affected. CAINE includes scripts activated within the Caja web browser designed to make examination of allocated files simple. Currently, the scripts can render many databases, internet histories, Windows registries, deleted files, and extract EXIF data to text files for easy examination. The Quick View tool automates this process by determining the file type and rendering it with the appropriate tool. The live preview Caja scripts also provide easy access to administrative functions, such as making an attached device writeable, dropping to the shell, or opening a Caja window with administrator privileges. The "Save as Evidence" script will write the selected file(s) to an "Evidence" folder on the desktop and create a text report about the file containing file metadata and an investigator comment, if desired. A unique script, "Identify iPod Owner", is included in the toolset. This script will detect an attached and mounted iPod Device, display metadata about the device (current username, device serial number, etc.). The investigator has the option to search allocated media files and unallocated space for iTunes user information present in media purchased through the Apple iTunes store, i.e., Real Name and email address. The live preview scripts are a work in progress. Many more scripts are possible as are improvements to the existing scripts. The CAINE developers welcome feature requests, bug reports, and criticisms. The preview scripts were born from a desire to make evidence extraction simple for any investigator with basic computer skills. They allow the investigator to get basic evidence to support the investigation without the need of advanced computer forensics training or waiting upon a computer forensics lab. Computer forensics labs can use the scripts for device triage and the remainder of the CAINE toolset for a full forensic examination!